Using a tester, check voltage between the “blue” output and the “common” output (white-orange). 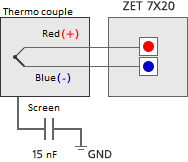 Deenergize ZET 7X20 and measure resistance between the “red” and “blue” outputs. The resistance must be within 10 to 20 Ohm at ambient temperature. Use only thermally-compensated cable for extending the cable between the TC and ZET 7X20.